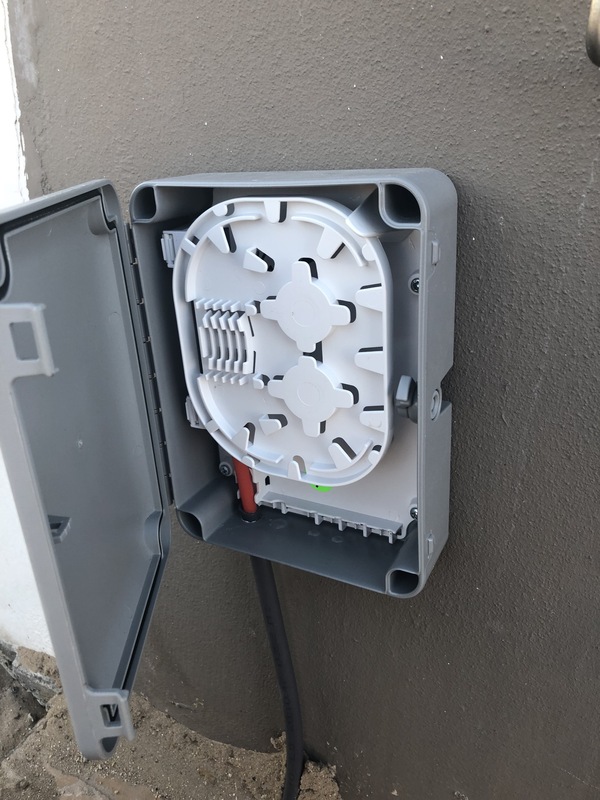 This post forms part of a series of posts that I will be doing to document my journey to obtaining Fibre To The Home (FTTH) in South Africa. 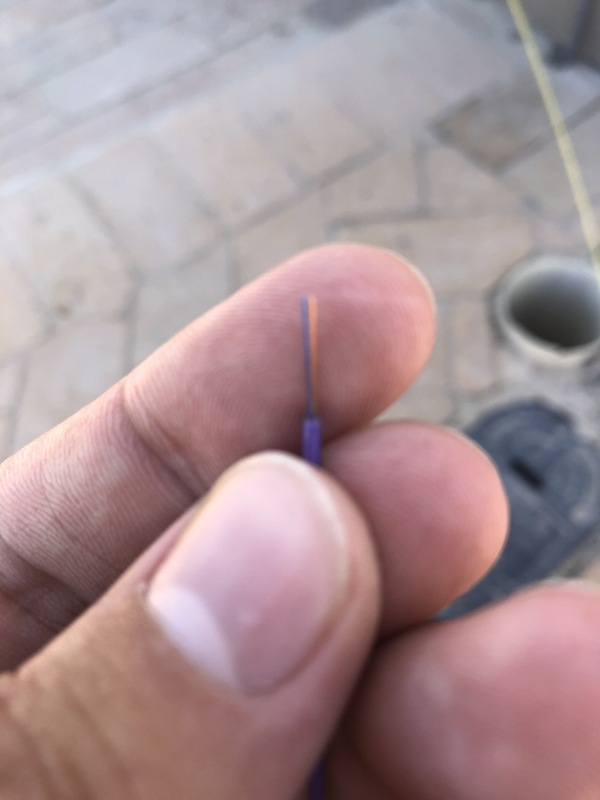 It all started back in 2014, Fibre To The Home (FTTH) was a hot topic on all the tech news sites and you were reading about all these complexes and suburbs being connected. Now to give some background, I live in Brackenfell, a rather largish suburb in the north of Cape Town right next to Durbanville, even though the area is a popular area for residents to live in the chances at that time was very slim for an FTTH rollout as most of the rollouts were happing in estates and expensive neighbourhoods. One day I noticed a team digging a trench opposite my house at the time, there were no houses on the opposite of our street and was separated by a small wall from the main road. I got a bit happy but that soon disappeared after speaking with the people to find out that the lines were Dark Fibre Africa (DFA) lines and are not an FTTH rollout. DFA basically provides Dark Fibre to other clients that need connectivity, more so business clients. A couple of years past and more digging ensued by the likes of MTN and Vodacom but still no FTTH. Then in July 2016 I bought a new house in the same area. Shortly after moving into the new place I saw they were erecting a cellphone tower on the church grounds behind my home and thought they will surely need fibre to be laid to this tower. Being fed up with ADSL speeds of 6Mbps and connectivity issues due to aging copper infrastructure I decided to try and find a way to get Fibre at my new place. After weeks of back and forth and numerous phone calls I finally found that the tower is a Vodacom tower and eventually got through to someone at DFA that put me in touch with an ISP that would be willing to install fibre to my premises, I was lucky enough that my house is only about 70m from the DFA connection point on the main road. There were some caveats though, I had to pay around R5k for the civil works to be done, which I thought was reasonable, but the thing that made me cancel the whole process was that they could only offer me a business package and I had to sign a 24 month contract which was around R4k pm for a 5Mbps fibre connection, and around R14k for a 100Mbps connection since they would only do these custom jobs for businesses. Back to copper it was, but then in 2017 I noticed that Durbanville was being rolled out with Fibre through Vumatel and it would make sense for them to move into Brackenfell seeing as it is right next door. I searched some local groups on Facebook and used our neighbourhood watch and soon found out other people in the area that were also campaigning to get the area online. A couple of meetings later with the various neighbourhood watches in Brackenfell and Vumatel, we got our area approve for the show of interest phase of an FTTH rollout in August 2017. Now how Vumatel works is they combine areas in a suburb into what they call a Fibrehood, then they start a show of interest phase, during that phase they need to get around 30% of residents in such a Firebhood to show their interest. If that is reached they start the planning and rollout phases. The thing is, because Brackenfell is so big, they divided it into 3 Fibrehoods, Brackenfell North, Brackenfell South, and Sonkring. At present only Brackenfell North and South has qualified, South’s rollout will start around the end of February 2018 and Sonkring still needs around 130 signups. I got excited but was told if we could not reach the 30% target chances are slim we will get FTTH. At some point around October 2017 I got a bit worried as the numbers were just not climbing so I started to get in touch with people at Vumatel and offered to be a champion for my Fibrehood, there were already quite a lot of people campaigning but it was mostly through Facebook and it had limited reach. That is when I got the idea of trying a campaign per foot, I basically took a tablet with an internet connection and went door to door during the day and some evenings knocking and notifying residents about FTTH, the advantages and that we could be getting it. I probably signed up around 100+ residents while going per foot and registering them on the Vumatel site. However, we were still around 150 signups short after that, luckily Vumatel informed me that they will also be doing flyer drops in the areas, a couple of weeks went past and then one day I got an email from my contact at Vumatel saying that our Fibrehood has qualified and we will have a townhall meeting on 9 November 2017. I attended the townhall meeting where the residents were informed about how the whole FTTH rollout works, there were also quite a lot of ISPs at the townhall promoting their services, they were literally throwing themselves at the residents just to get a signup. The next day Vumatel marked our Fibrehood as “Build In Progress” on their coverage map and they also started the civil works on that day, a small team were spotted here and there, but the next Monday a couple of areas were covered in pink barriers with large teams busy digging which made it clear that things are happing. Different areas the Brackenfell North Fibrehood has been devided into. 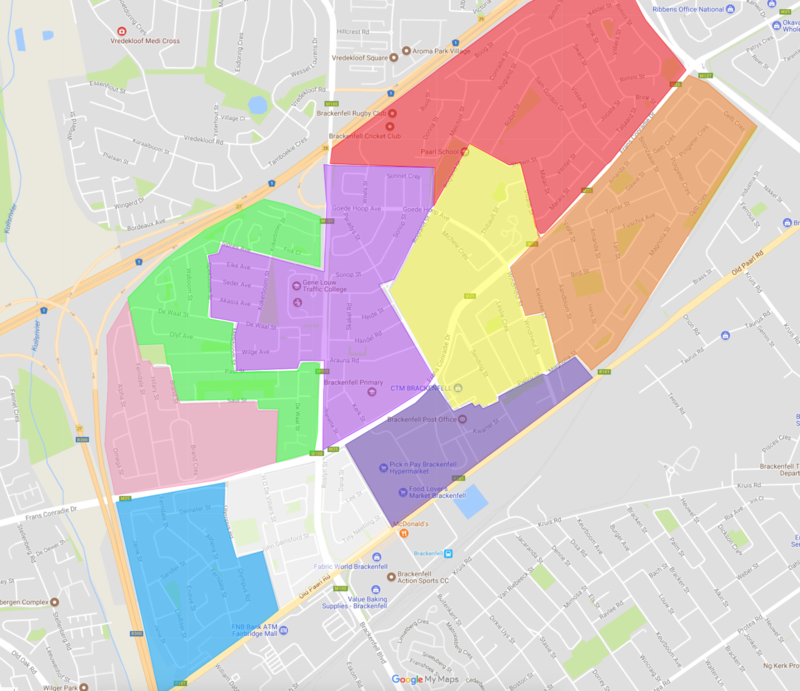 How Vumatel works during the rollout process are they divide a Fibrehood into different smaller areas, our area, Brackenfell North, are divided into 9 smaller areas. They only do work in certain areas at a time, I am part of area 6 and unfortunately did not fall into the first 2 area that they started in. I was quite impressed with the speed at which they were trenching and installing trunking, within in a matter of 3 weeks most of the 2 areas were closed up, and by the 10th of December, I spotted the Fusionoptics team making the splicing connections to the street cabinet for one of those areas. That same day my area was full of pink banners and they started drilling holes underneath the driveways and roads, after speaking with some of the people on the street our area was going to be spared digging up driveways, they dig two big holes on either side of your driveway and then they used what they call a mole to drive a trunking pipe underneath the driveway eliminating the need to remove paving, tar etc. They dug the holes next to my driveway but then a couple of days later they returned informing me that my side of our street, unfortunately, need to have the driveways opened up due to a main cable that needs to run on my side of the street that is too big to fit into the trunking they do underneath the driveways. On the 15th of December I was informed that construction had to be paused due to a law by the City Of Cape Town which prohibits any construction to take place during 15 Dec and 15 Jan. There I was another month having to wait without any progress, I was feeling a bit optimistic though as the map for our area showed an estimated completion date of Jan 2018. 12th of January 2018 approached and all of a sudden we have an influx of workers in our neighbourhood, I am talking literally around 200+ people with shovels all positioned around 10m apart for blocks digging, by that evening they were putting the fibre trunking in and filling up the holes for my street and a couple of other blocks, they were working quite late that day, especially the people in my street that dug up the driveways, by around 7pm I went and looked and they filled up my driveway. The next day, a Saturday, they were back putting up my wall box and putting my paving into place again and the following week they completed most of the restoration work. As of today I still have a small portion of paving missing which they are actually repairing as I am typing this, they were apparently waiting for stock of the colour of bricks I use. Box mounted on wall from where the fibre core will be pulled into your home. Today the 24th of Jan 2018, I took my usual morning stroll through the neighbourhood all the construction workers have pretty much left the area with trunking in place throughout. I also spotted a Fusionoptics van parked with people fiddling in the ground and wall boxes so I approached one of them and had a bit of a chat. They are the people that are actually blowing the fibre cable through the trunking and terminating it into the wall boxes, the gentleman was very polite and explained to me the process and showed me how they blow and connect a wall box up, he also showed me the fibre strands, literally like 2 pieces of hair that are inside a casing as thick as fishing gut that goes into 2 other protective trunking into your wall box and terminated to a pigtail. Having an interest in networking and some history with wireless networks I found it quite interesting and nice to see how they fibre process works compared to long-range wireless. He also informed me that they are aiming to have all the houses in our area connected up and live by end of next week Friday, 3rd of Feb 2018. Each house gets one fibre casing consisting of two fibre strands capable of delivering up to 1Gpbs each. So far I have been quite impressed with the speed of the rollout and their reinstatement work, there are some houses here and there that are waiting for some reinstatement work to be completed but from what I have heard that is due to the contractors waiting for supplies of certain bricks as was the case with mine. Vumatel has since updated the rollout map extending the estimated completion date for my area to Feb 2018 which seems like it might actually be live around mid February from what the people on the street tell me. I placed my order with Vumatel shortly after they marked our area as in progress so I am all ready to get my line installed into my home. Initially I signed up with WebAfrica as my ISP since I currently have my ADSL through them and they were offering a free install package at the time, however after going through their TOS I found they are not truly month to month as they claim when you get the free install package and you are basically tied into a one year contract. That and reading some stories on MyBroadband about their Fibre service and throttling I decided to cancel with them and instead signed up with Cool Ideas. Now Cool Ideas is a relatively new ISP to me, but after reading up on them and seeing all the feedback from the local tech community it persuaded me to choose them. They focus on Fibre Internet and have been ranked as the best Fibre ISP in South Africa two years in a row, they do not do any shaping or throttling, in fact, they do not even track usage at all on a customer level, if you are interested in knowing how much data you consume you will have to put your own data tracking in place. Their support seems to be top notch, they have a dedicated person on the MyBroadband forums attending to customer queries/issues and even do so during evenings, weekend and holidays, another plus! Unfortunately, Cool Ideas does not offer any packages with free Vumatel installs, which I am okay with, but they do offer free activation and a free router all while providing a true month to month product. I also found out that should I wish I can choose to pay off the Vumatel installation over a 3 or 6 month period interest-free, which if you are on a budget and do not want to be tied into a contract with an ISP a great option. 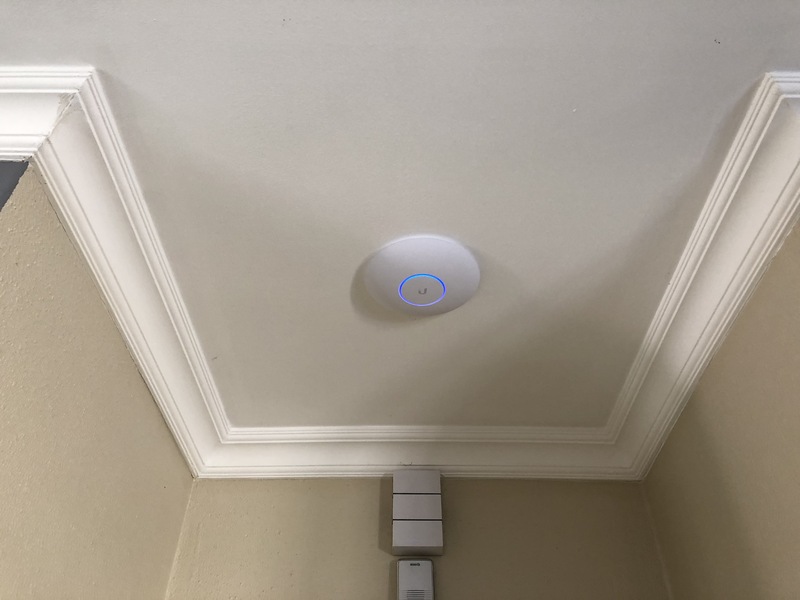 Ceiling mounted Ubiquity Unify AC Pro Access Point. After signing up with Cool Ideas I enquired what the free router is that they provide since my home is relatively large and I ordered a 100Mbps synchronous package I needed something that would be able to deliver the speeds to all my wireless devices while also providing adequate coverage throughout my home without affected the speeds. The router they provide is a TPLink WR840N consumer grade a/b/g/n router which was nothing cutting edge, same as my ADSL one which has coverage issues inside my house and a maximum wifi throughput of 300Mpbs. If you order their 200Mbps package they provide you with an AC capable router. Since I have roots in wireless networks with my past participation in CTWUG, I am fairly up to speed with enterprise WiFi and routing, AC WiFi was the way to go and after some research, I decided to go with Ubiquiti hardware. More specifically I went with the Edgerouter X as my router which has all sorts of functionality you can set up to do your own routing, QOS and usage tracking, and a Unifi AC Pro access point which is capable of delivering up to 1.7Gbps speeds over WiFi to devices capable of AC. I mounted it centrally in my house to the ceiling and getting speeds to the router not dropping below 300Mbps on the furthest points of my property which means it is adequate enough to max out my Fibre connection from any device on my property and leaves me with room to upgrade my fibre connection to 200Mbps which is the maximum speeds Cool Ideas are currently offering. I am now all ready for my fibre installation once my area becomes fibre ready, I have existing trunking in place that leads from the pillar where my wall box is installed into my home which should make install day a breeze for the Nano Fibre team which handles all Vumatel’s installations. Stay tuned for part 2 where I will be documenting the actual installation into the home, and then part 3 where I will be wrapping up the series and providing some final tests and reviewing Cool Ideas as an ISP, perhaps also throw in a couple of tips and tricks in there that could speed up getting connected.